The new Infiniti Q30 debuted at the Frankfurt Motor Show last month. Nissan’s luxury subdivision, Infiniti is amidst a crucial re-branding effort that concentrates on elevating the brand’s image to the level that is pleasured by German luxury competitors such as BMW, Mercedes Benz and Audi. Henceforth, the Infiniti Q30 prefigures an upcoming design from the brand that targets on the Mercedes Benz CLA- Class sedan (A-class Hatch in Europe) and the Audi A3. The brand has not yet revealed much about the car but based on how the concept looks it won’t be wrong to say that it resembles the Infiniti’s 2011 Etherea concept, just more production feasible and more attractive. This car is to be loved at the very first sight, and at the first sight it looks like a crossover. Infiniti says that the new Q30 is only one third of a crossover. The other two thirds of the design inspiration are a hatchback and a coupe. That’s like a treat of three car designs at the price of one, cheering up a lot of contemporary SUV lovers. The design brief of the car might create ambiguity about the Q30’s vehicle type but the name clears the fact that the Infiniti Q30 is follows the Q-based convention that the brand recently switched all of its line over to. 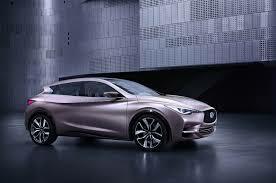 The Q30 is anticipated to be smaller than the three series sized Q50 sedan by the brand. A more certain fact is the Infiniti Q30 will be a front-wheel drive. The Infiniti Q30 amazingly resembles the Mazda 3 five door. But working more corporeally, Infiniti parent firms Nissan/Renault announced a partnership recently with Daimler, which is parent conglomerate to Mercedes – Benz. The front drive based Mercedes A-Class which also serves as the basis for the CLA Class sedan. With the partnership in hand, and the Q30’s taller stance, it won’t be a surprise if the new model from Infiniti also offers four driven wheels. The powertrain choices offered by the Infiniti Q30 might put a question in front of the buyers. Reason being that the Q30 comes with style in droves, mixing the aggressive front end of the Q50 with a stunning pair of straight sculpted body creases running down the each side of the body that are flowing and complex. As said earlier that this car hints about being a more practical version of the Etherea concept but interestingly the Q30, unlike the next generation supercharged four cylinder/electric motor hybrid system powered Etherea, is likely to be powered by a less exotic gas-only setup. Probably a turbocharged four-cylinder engine! Borrowing for the lower-output Q50, the car is guessed to be running with 210-240 horsepower. The brand hopes the Q30 will prove to be a magnet for young buyers in global markets including China and Europe, while firming its roots in the U.S. After the slight success in the niche of luxury compacts with the Sentra related G20 sedan of the 1990s and early 2000s, the half-car half-crossover compact Q30 is believed by the firm to be a game changer.